The International Competition Network (ICN) in conjunction with the World Bank has named the Competition and Consumer Protection Commission (the Commission) as one of the best Competition Authority. The Commission was awarded the recognition on grounds that it was the best among Competition Authorities that were advocating for Competition in key domestic markets. The heavily contested awards attracted a total of forty three (43) Competition Authorities from countries around the world, among them France, Kuwait, Kenya and Pakistan Competition Authorities. 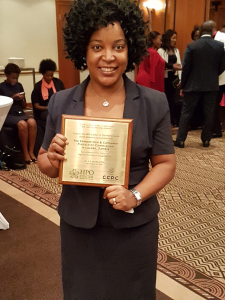 The recognition was made at the just ended ICN 2016 Conference in Singapore where the Commission received the winners prize for its efforts in fostering competition values and principles that enhance consumer welfare in the economy of Zambia. The World Bank and ICN had four (4) themes, and the Commission together with France scooped the first prize in the second theme dubbed Advocating competition in key domestic markets to maximize the benefits of trade”. The second theme sought to recognize and award the competition agency that created maximum impact on the market that aimed at benefiting consumers and the economy as a whole. Accepting the prize on behalf of the Commission, Chief Analyst, Patrick Chengo, thanked the World Bank and ICN for recognizing the work and efforts of the Commission in bettering the Zambian economy. Mr Chengo stated that the recognition was not only a milestone for the Commission and Zambia as a country, but an achievement which will motivate the Commission to enhance its interventions on competition and consumer protection matters in various sectors of the Zambian economy. The three (3) days Conference saw Competition Authorities from all corners of the world gather to share different techniques and practices used to enforce Competition law. The Commission was thereafter given a platform to share its experience on how its intervention had impacted on the Zambian forestry sub-sector, where the Commission curtailed any form of anti-competitive conduct, a situation which resulted in job retention and creation. The Commission cited the Zambia Forestry and Forest Industries Corporation (ZAFFICO) case it handled in 2014 as one of the cases that had a great impact on all the players in the Forestry sub-sector starting from the saw millers to the builders who are the final consumers of the timber products. The Commissions intervention meant that ZAFFICO would have to come up with a competitive process of allocating the soft and hard wood licences to both existing and new Saw Millers, other than completely foreclosing the market to potential entrants. Following the intervention, ZAFFICO was directed to come up with a competitive bidding process that would promote sustainability in the sub-sector. The results of the intervention benefited a cross section of Zambians in various sectors of the economy such as manufacturing and construction among others. The Commission also recommended that the government through ZAFFICO should come up with a deliberate policy for saw millers to be engaged in replanting trees in order to promote sustainable forest management.